While the main event continues today, AnimEvo is going strong with its many side tournaments, including the puzzle game Catherine. 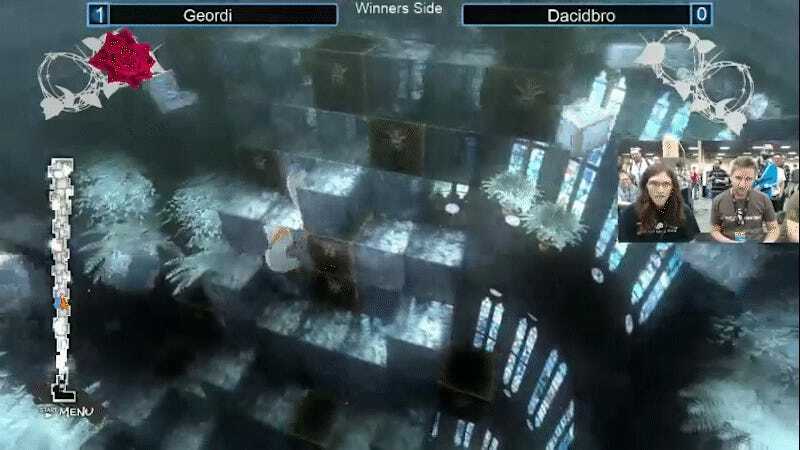 A 2011 game made by Atlus, the story-driven game’s competitive mode has a cult following that culminates each year at Evo. This year’s event is already off to a strong start, with Geordi (called the “NorCal killer by the commentators) knocking last year’s champion David “Dacidbro” Broweleit into the loser’s side of the bracket. The goal of the game is simple: climb the tower while staying ahead of the encroaching void below. You win by either reaching the top first, or by outlasting your opponent. The two players, in sheep avatars, push and pull blocks, either to climb higher or prevent their opponent’s progress. A clever position can force an opponent onto an island, waiting for their inevitable plummet. Well-known players are already being challenged by newcomers, and the play even in the early rounds has been fantastic. If you want to tune in and watch, head over to Ghoul02's Twitch channel, as the bracket plays out throughout the day.